Kendrapara/Jagatsinghpur/Khurda: Six persons were killed and 11 seriously injured in separate road accidents in Odisha in the early hours of Monday. According to reports from Kendrapara, three persons, including a woman, died on the spot and six others were seriously injured when a Bolero jeep collided head-on with a truck near Kattia Chhak on Cuttack-Chandbali Road. Police said nine members of a family from Mumbai had come to Rajnagar to perform ‘shraddha’ of their kin. After performing the rituals, they were on the way to Bhubaneswar to board a Mumbai-bound train when a speeding truck collided head-on with the vehicle. While three persons died on the spot, six seriously injured were rushed to SCB Medical College and Hospital in Cuttack where one person succumbed to his injuries. The condition of the three persons, who have gone into a coma, is stated to be critical. The incident took place between 6 am and 7 am. Police later sent bodies of the three deceased from the mishap site to the Kendrapara district headquarters hospital for postmortem. Police suspect that the mishap took place due to dense fog. The identity of the deceased and the injured were not known till reports last came in. In another incident, a man was killed and two others were seriously injured, when a scooter they were riding rammed a roadside tree near Rahadinga Chhak on Jagatsinghpur-Jayapur road in Jagatsinghpur district. Following information, police rushed to the spot and admitted the two seriously injured persons to the district headquarters hospital. Tension ran high in the area after the locals, alleging that the mishap took place due to poor road condition, staged a road blockade. In Khurda, three staff of a 108 ambulance van were seriously injured when the axle of the vehicle broke near Daspalla Dam Chhak this morning. 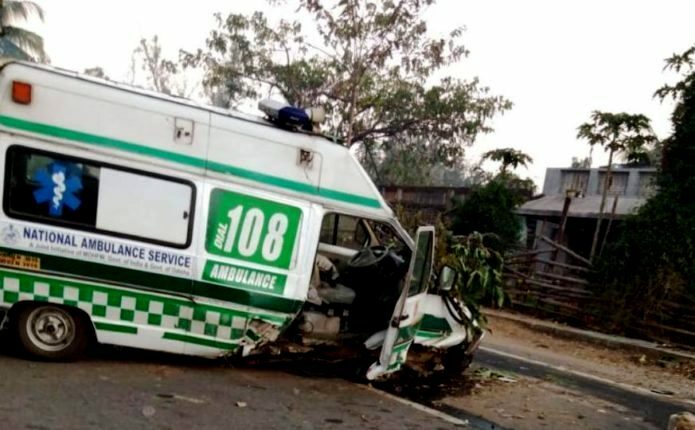 According to sources, the ambulance van was on its way to pick up a patient from a nearby village when the mishap took place. The three seriously injured staff were later admitted to the district headquarters hospital. In another incident in Jagatsinghpur district, one person was killed and another seriously injured when a truck hit their bike near Hatitanki Chhak on Jagatsinghpur-Paradip Road. Following the incident, locals staged road blockade demanding the construction of humps near Hatitanki Chhak and closing the divider opened by the National Highways Authority of India (NHAI).